One of my very favourite movies of the year so far is Steven Spielberg’s Ready Player One, which is arriving on Blu-ray this week. Based on Ernest Cline’s bestselling novel of the same name, the film offers a wildly entertaining and visually dazzling thrill ride that pays tribute to countless classic movies, while also offering an engaging and surprisingly moving story about nostalgia. I wrote extensively about the film when we reviewed it back in the spring, and you can read our three views right here. The Blu-ray comes packed with about two hours of bonus features. The centrepiece of them all is the very well done production documentary Game Changer: Cracking the Code which, at nearly an hour long, offers a comprehensive look at the making of the film from a variety of different angles. It starts with the writing of the original book, and takes us through the casting process, the costume design, the motion capture process, and also how they crafted that stunning sequence recreating iconic moments from The Shining. This is a superior supplemental feature, that helps pull back the curtain on the film’s unique and seamless mix of live action and motion capture animation. The next biggest piece is Effects for a Brave New World, which offers a fascinating and in-depth look at the creation of the film’s different visual effects, including how Steven Spielberg used groundbreaking VR technology to help with the pre-visualization process. The production team basically treated the live action stuff and the scenes inside the virtual reality world of the Oasis as two separate movies, using seamless digital enhancements for the visual effects of the former, and choosing a more stylized look for the latter. It’s also worth noting that the visual effects of the real world scenes were handled by Digital Domain, and the Oasis stuff was done at Industrial Light & Magic. These pieces are rounded out by four shorter featurettes. The ’80s: You’re the Inspiration offers a short but satisfying look at some of the many references to the pop culture of the decade that are present in the film; Level Up: Sound for the Future features sound designer Gary Rydstrom talking about how they went about crafting the wide range of sounds for the film, envisioning it as an auditory experience as much as a visual one; and High Score: Endgame specifically focuses on Alan Silvestri’s score for the film, including how he worked in elements of his iconic theme from Back to the Future. Finally, Ernie & Tye’s Excellent Adventure features Ernest Cline and Tye Sheridan coming together to talk about the film at Cline’s home in Austin the week before the world premiere at SXSW, and even going for a drive in the author’s DeLorean. Between the amazing entertainment value of the film itself, and the quality of these bonus features, the Blu-ray comes highly recommended. 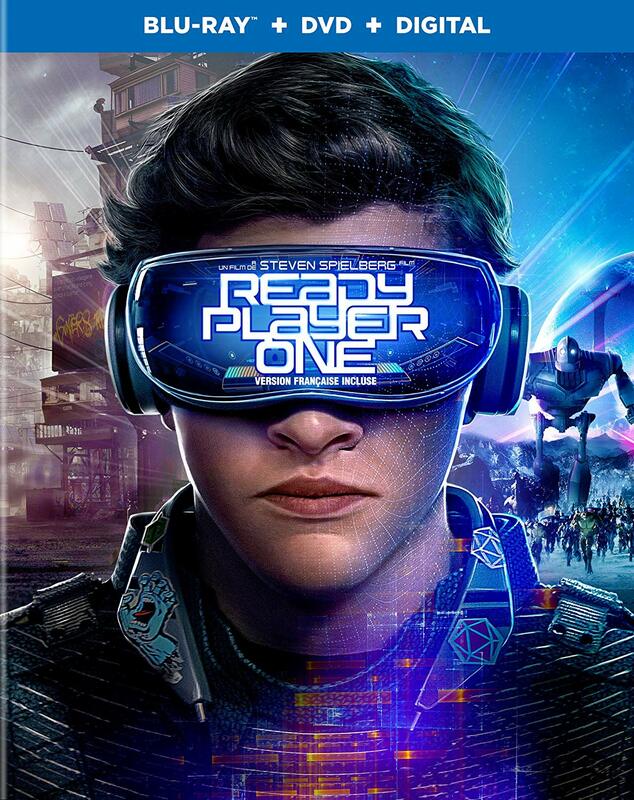 Ready Player One is a Warner Bros. Home Entertainment release. It’s 140 minutes and rated PG.